You are here: Home Funeral Traditions Funeral food – it’s a thing! It might not be the first thing that springs to mind when you think of a funeral, but funeral food has it roots in every culture. Whether it’s to commemorate the dead or console mourners, focusing on food around the time someone dies is as firmly embedded a tradition as any other you might think of. And it’s not just your nationality that dictates the customs; religion and family convention all have a role to play. But it wasn’t until I was at a Death Salon conference a little while ago that I thought about our traditions in the UK – or maybe in England specifically. Most funeral food i’ve experienced during my life has been comprised of pre-bought sandwiches – absolutely nothing wrong with this of course, but when I heard how mourners in New Orleans and surrounding areas all pitch in with well known family crockpot recipes it made me think about how important it can be that everyone is able to participate in that last farewell and how well suited food is to enabling that participation. A recent funeral reminded me of this again – it was quite a big affair in a local hall. Some food had been laid out before people arrived, but as people arrived, so too did more food. It seemed to bring an amazing community feel to this gathering that I hadn’t really noticed before. There was quite a buzz as new dishes of steaming food appeared and you could tell that people felt pleased to be able to contribute. And then again on Women’s Hour last week when Emma Freud was saying how she would like everyone to bring food to her funeral – especially cake (something I can quite agree with! ) I was reminded of a gentleman called Laurie. At his funeral everyone ate all his favourite food from battenburg, to fresh strawberries to pork pie; it was all there, another great reminder of good times previously shared. But food can also bring a unique kind of comfort. It may not be the healthiest recipe in the world but I thought I’d finish by sharing a fairly well known funeral potato recipe. Potatoes seem to work pretty well as comfort food! The recipe has been previously shared by Charles in the Good Funeral Guide and originates on this American website. And if you like potatoes and are at a loose end this Wednesday (17th Feb) with a young family you might like to join the Highbury Orchard Community for their ‘Potatoes are Us’ day of games, crafts and food at 1pm – you can find out more on their Facebook page. You’ll need one 30-ounce bag of frozen shredded (not cubed) hash brown potatoes. 1. Adjust oven rack to middle position and heat oven to 350 degrees. Melt butter in Dutch oven over medium-high heat. Cook onion until softened, about 5 minutes. Add flour and cook, stirring constantly, until golden, about 1 minute. Slowly whisk in broth, half-and-half, salt, thyme, and pepper and bring to boil. Reduce heat to medium-low and simmer, stirring occasionally, until slightly thickened, 3 to 5 minutes. Off heat, whisk in cheddar until smooth. 2. Stir potatoes into sauce, cover, and cook, stirring occasionally, over low heat until thawed, about 10 minutes. Off heat, stir in sour cream until combined. 3. Scrape mixture into 13 by 9-inch baking dish and top with potato chips. Bake until golden brown, 45 to 50 minutes. Let cool 10 minutes. Serve. 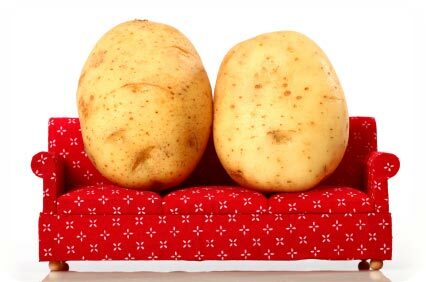 To make ahead: Potato mixture can be refrigerated in baking dish, covered with aluminum foil, for 2 days. To finish, bake potatoes 20 minutes. Remove dish from oven and uncover. Top with potato chips and bake until golden brown, 45 to 50 minutes.